Please look at the Home page for any weather related postponements. 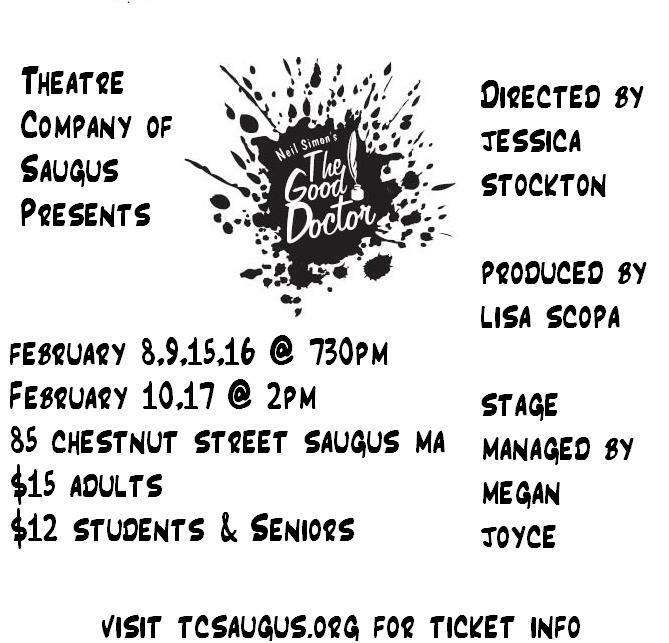 The Theater Company of Saugus is proud to announce our spring 2013 production of “The Good Doctor”. This dramatic comedy is by Neil Simon, one of the greatest and most prolific American playwrights. It is based on the work of the great Russian dramatist and short story writer Anton Chekhov, who also worked as a medical doctor. This show dramatizes nine of his stories, including a wide variety of settings and characters. There will be six performances of The Good Doctor, in the evening on Fridays and Saturdays, February 8, 9, 15, 16 at 7:30 PM, and with matinees on Sundays, February 10, 17, 2013 at 2:00 PM. The show will be presented cabaret style, with the audience seated at small tables. Light refreshments and appetizers will be for sale. A cast of Theatre Company veterans and newcomers each play a variety of roles in the various short scenes. The stories are narrated by The Writer, based on Chekhov himself. The descriptions and cast of each show are shown below. If you are interested in being on the production staff of the show, back stage, or front of house, please contact us. The Writer introduces us to some stories. Cherdyakov makes way too much of something, much to the annoyance of the General. The Governess gets her pay from the Mistress. Kuryatin does some dental work on the Sexton. Peter is the world’s greatest seducer of other men’s wives. A Sailor wants to entertain the Writer. The Policeman almost interferes. The Girl auditions for a role in one of Chekhov’s greatest dramas. A poor Woman makes a claim at the bank. Two old military officers hold their weekly meeting. A Father wants to introduce his Boy to women.